What happens when two super-hots meet? Another hottie is born. 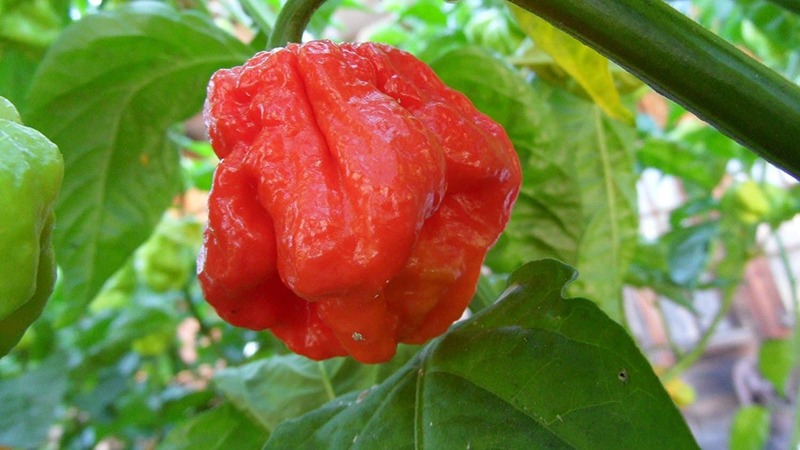 The 7 Pot Primo is the fiery cross between the wickedly hot Naga Morich and the equally scorching 7 Pot pepper. This is a stable hybrid – having reached more than seven generations, so the 7 Pot Primo is no flash in the pan. It’s a widely sought after super-hot pepper for those that love extreme eating. Not only for its fruity punch, but also for its looks. Its pronounced scorpion-like tail gives this pepper an outer attitude to match its fire. How hot is the 7 Pot Primo? As with all super-hots, we are really splitting hairs here when we break down the heat. In short – it’s scorching. But how does it compare? The 7 Pot Primo with its 800,000 to 1,268,250 Scoville heat units (SHU) has a heat comparable to the 7 Pot pepper roots, with a lower floor and a slightly hotter ceiling. At its floor, it’s similar to a ghost pepper in spiciness (800,000 – 1,041,427 SHU) and while a traditional 7 Pot tends to tap out at 1.2 million SHU, the 7 Pot Primo has a little something extra, likely due to its Naga Morich heritage (they can reach 1.5 million SHU). When compared to our jalapeño reference point, the 7 Pot Primo is at least 100 times hotter with the chance to be up to 507 times hotter. It’s way too hot for general consumption without dilution. 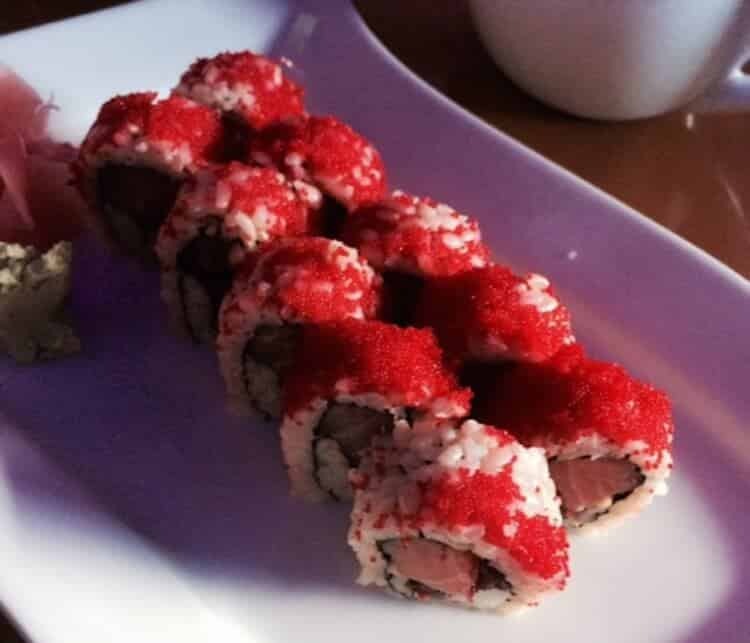 It just has that “look” that screams heat – pock marked, folded, with a sinister scorpion-like tail similar to that of scorpion peppers. It matures from green to a shock red, though there are color variants of the 7 Pot Primo like yellow and orange. This is definitely a pepper with an extreme attitude that matches its heat, and that’s why the 7 Pot Primo, even as a comparatively new hybrid, has such a following among chili heads and extreme eaters. In terms of taste, the 7 Pot Primo has a fruity flavor (citrusy with a hint of floral) that’s similar to the Naga Morich. Though, of course, the fruity flavor is quickly replaced with pure fire as the primary flavor. What’s up with the name? Primo? The Primo name certainly adds to this pepper’s attitude. Primo means “of top quality or importance” which certainly is cool branding for an extreme pepper. But the moniker has more of a backstory than that. “Primo” is the nickname of Troy Primeaux – the Louisiana-based horticulturist who crossed the Naga Morich and 7 Pot peppers to create this hybrid – hence 7 Pot Primo. Notably, Troy Primeaux is also a musician – a member of the rock band Santeria. There is a showmanship to this pepper which just seems to fit with this history. How can you use 7 Pot Primo peppers? Any discussion of using super-hot peppers starts with the required warning: take great care when handling these chilies. Super-hot peppers can cause severe chili burn, just from the handling of them. Wear gloves and kitchen goggles to keep safe, and know your options for combating chili burn if/when it happens. That said – 7 Pot peppers get their name from their ability to heat 7 pots of chili or stew. One pepper goes a long way. The same is true with 7 Pot Primo. It can be used sparingly as a heat source (a little sliver can provide a lot of heat). It’s also popular for extreme hot sauces and other products like super-hot jerky. Where can you buy 7 Pot Primo peppers? Like most other super-hot peppers, you typically won’t find this chili or its products at your local grocer. Your best bet is buying online. You can find 7 Pot Primo seeds, hot sauces, and more via Amazon (see its options here) and other online retailers. 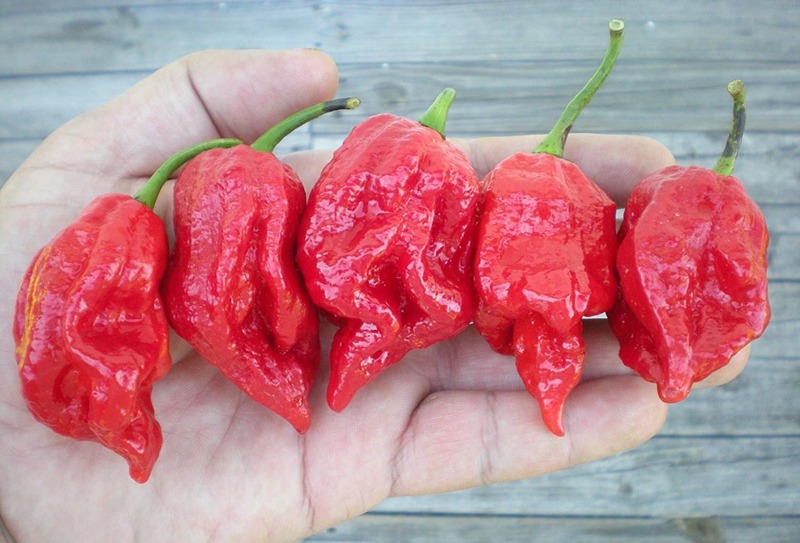 As super-hots go, the 7 Pot Primo has it all – the heat, the wicked look, and the unique name. It may not have the recognition of the infamous ghost pepper or Carolina Reaper, but it’s still relatively new and growing in popularity. If you’re one for extreme eats, this is a no doubt chili for your spicy repertoire.